Update is Christchurch City Councils report on the state of the City's environment. These pages have been reformated into the Social and environmental Trends Reports. Christchurch City Update 2000 is the fifth report on the state of the Citys environment. It is a non-technical, descriptive report designed to provide community representatives, decision makers and the wider community with up-to-date information on Christchurchs demographic, environmental and economic trends and issues. Topics included in this report are those known to be of interest to Christchurch people. They have been identified through ongoing consultation and discussion with a range of Council staff, elected members and the general public. A wide variety of other local and international monitoring programmes have also influenced the form and content of this report. 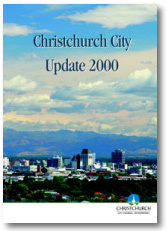 Christchurch City Update 2000 is produced as part of the Councils State of the Environment Monitoring Programme which was initiated during the mid-1990s. The programme was developed in response to the requirement under the Resource Management Act (1991) for territorial local authorities to monitor their environments. It has also been driven by the increasing need within local government for accurate information for decision making and policy development, and the communitys growing appetite for information about the wider environment. Update 2000 can be viewed in Adode PDF format below either in individual sections or as a single file containing the whole document (5.1Mb).